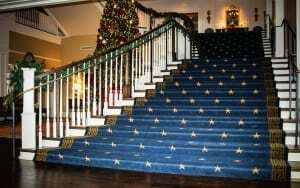 This week, as we celebrate Veterans Day and share our gratitude for the sacrifices made by members of our armed forces, we are excited to feature one of our signature projects: commercial stairs designed for the Army-Navy Clubhouse in Arlington, Virginia. We would like to also extend a special thank you to our Veteran partners, customers, and employees’ family members. To complete this stunning flared stair, our team constructed and installed the steel stair carriages and cladded them with wood. 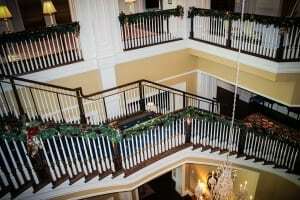 We also crafted and installed both the wood and metal railing systems. The perspective below gives a sense of the magnitude of the build, including a beautiful series of balconies throughout the space. Finished with star-studded carpeting, the commercial stair is a perfect fit for this patriotic club’s elegant and sophisticated atmosphere. 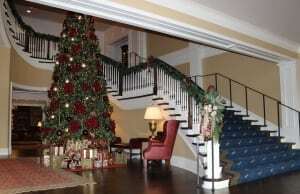 As is evident in these photos, the staircase is stunning during the holidays, but its classic design and beautiful finish create a gorgeous look year-round. We are proud to support architects, builders, contractors, and designers across the nation by providing the highest quality commercial stairs. We leverage vast industry experience and diverse product offerings to deliver the highest quality custom staircase and handrail systems. We share the high expectations of our clients, and we aim for perfection in each project – cohesive design with a flawless fit and finish. As the single source of responsibility for each commercial stair and handrail system that we deliver, we stand behind our products and offer a warranty on our staircases.